I've always been a dog person. I love their loyalty, their generosity of spirit. Cats, on the other hand, seemed aloof and demanding...and I really don't do aloof and demanding. But once my dog passed away, the neighbor's black cat set about seducing me with his feline wiles. 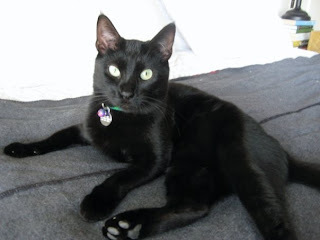 Coincidentally, this all happened around the time I was starting to write my witchcraft mystery series, so it seemed rather appropriate to have a decidedly un-aloof, but demanding, black cat named Oscar hanging out with me while I wrote. So this got me thinking...what's with the black cat and witches stereotype? 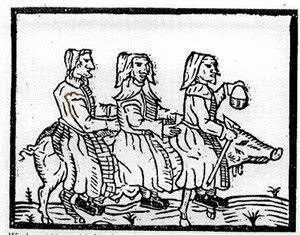 In Europe, witches were believed to have animal familiars, who functioned not only as companion animals but also as magical helpers. Cats were the most commonly mentioned witch's familiar, but not the only one. 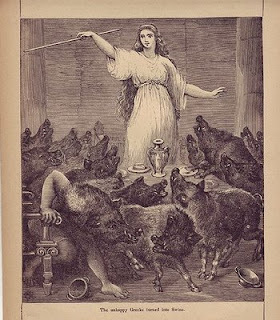 Witches were also associated with dogs, rats, snakes and toads...even pigs. Who ever heard of a piggy familiar? In Greek mythology, the witch-like Circe lived on the island of Aeaea and was known for her knowledge of botanical potions. She was fond of transforming her enemies, or those who had offended her, into animals. Notably, she turned Odysseus’ men into swine. In the New World, witches and curanderas, or folk healers, are often associated with naguales. The nagual is like an alter ego, an animal familiar that lives a parallel life to your own. 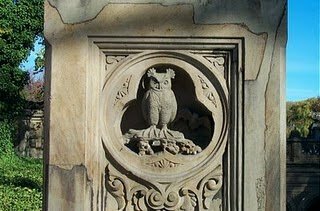 In Rodolfo Anaya’s beautiful novel Bless Me, Ultima, the elderly curandera (a folk-healer) has an owl as her guardian spirit. It was born at the same time as Ultima, and will die when she herself passes over. As in Europe, the nagual is often a creature of the night: an owl, a toad, a coyote. Some believe that when one dreams, it means one’s nagual is traipsing about on adventures. 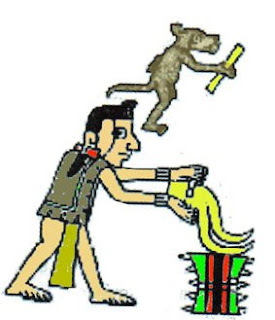 Nagualism is linked with ancient pre-Columbian shamanistic practices through depictions of humans with animal features, found in the surviving art and books of the Olmec, Maya, and Aztec peoples. So am I saying that Oscar-the-black-cat is my spiritual counterpart, some sort of shape-shifting totem? Nah. But it sure is fun to think about what trouble my familiar might get into, traipsing about at night while I dream. That's just because you and Sophie already covered the good stuff about pets...didn't feel like I could add anything new by gushing about my sweet old Sam, or any of the other pets I've had in life. LOVE your academic information. I love knowing how things are connected. It's fascinating to me that so many cultures have some sort of animal spirit associated with their human spirit. ps. How many Pens have BLACK cats? I do!! And he is not at all aloof. I loved this post me and my cat Lilly, my writing companion. The tidbit about the animals being our alter egos in our dreams really struck a chord. I hope I'm cat. I am Leo, so there's hope. Are you going to be at UCLA this year? I hope to see you there since there's no more LA Mystery bookstore. :( Can't wait for the next Lilly book. Thanks for the comment! I won't be at the LATFOB this year, unfortunately. I *will* be in town for the Romantic Times conference in April, however, and back in June for the California Crime Conference. I love the bit about our dream alter egos, too. I always think about it after particularly vivid dreams!